Hampton Olympic Grip (HOG-R) plates have an advanced design that makes them super-attractive and more functional than ever. 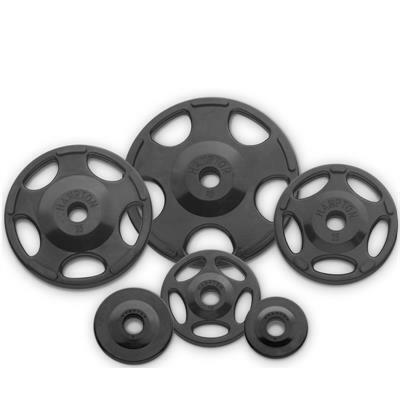 These user-friendly plates have generous-sized grips, making them easy to pick up off of the floor and or a rack, and the recessed design all but eliminates the risk of pinched fingers when stacking. Before attempting to peel a 45-pound plate off the floor was a laborious and potentially dangerous task. With our clever design, this is an issue of the past. Utilizing slim grips, the user can maneuver the plate with ease. The structural integrity of all of the Hampton HOG plates are warranted for 5 years as well. Hampton Fitness HOG Rubber Encased Plates - Attractive Design, Heavy Duty Performance - perfect for any commercial or home gym. Most durable coating in the industry.